You might be searching for the best bass drum pedal, and if that’s the case, you are in the right place. We thoroughly researched the market and found out what makes a good bass drum pedal, and in our search, we concluded that the TAMA HP200PTW model is one that you should have a look at. It’s very fast and smooth due to the Spring Tight technology it employs. It’s also highly adjustable, something that drummers need. The pedal’s cam accelerates very well and offers enough speed and power. If you cannot find this model for sale, you should consider the PDP By DW Concept pedal, which is next on our list. It feels like a professional bass drum pedal. The Spring Tight technology provides a smooth and fast response. The footboard returns fast in its initial place due to the same technology. It’s a pedal that is highly adjustable - you can modify the angle of the beater and the spring tension. Some users reported that the pedal is quite slow sometimes for double-bass techniques and that may be due to the fact that the bolt holding the axle does not grab too well. This is an adjustable pedal that can be used for advanced double-bass techniques and has a professional feeling. The direct drive mechanism offers increased speed and a better feeling when transmitting the force from the footboard to the beater. Detachable springs ensure that your pedal is kept intact and strong while traveling. It offers a memory lock system that ensures the height and angle is consistent. An unexpected problem that this pedal has is that the beater has the tendency to stick to the batter head while in use. You should thus turn it around and use the harder part of it. The direct drive mechanism is what makes this pedal unique, offering the control and feeling that a player wants. An ovalized pedal, resembling the shape of the foot, which offers it a great look. It’s highly adjustable and has a bearing spring rocker assembly that also offers a scale, so the drummer knows the angle of the beater. It has a system that allows for easily clipping the pedal to the drum. When used, the pedal is very silent. Although a nice feature on paper, the drum key clip is not durable at all, most users complaining that it broke the first time they used it. Fortunately, it isn’t an important part of the pedal. This pedal offers great adjustability features. This will allow the drummer to have a great time while using it. After taking into consideration a large number of bass drum pedal reviews, and reading experts’ opinion, we managed to pick a number of pedals that should fit most people. These pedals offer quality and each of them has unique characteristics that make it stand out. Here they are. Constructed using the same concepts as the top-of-the-line bass drum pedals, this one offers all the performance you want while still being accessible to anyone. When using this pedal you will sense a surprisingly smooth and fast response and that is due to the Spring Tight technology incorporated. It’s a special system that uses a spring tension rod that accelerates the speed of the beater stroke action. It also helps the footboard return back in place, after it has been pressed. That offers a great feeling. The design of the cam, the part of the pedal that accelerates the beater, is built to offer the highest speed and power possible at the end of the stroke. The best part is that you can adjust both the angle of the beater and the spring tension. This will allow you to use the pedal at its best capacity, while you maintain a comfortable position. In terms of construction, this pedal comes into attention due to the direct drive system that it incorporates. The concept of this design is the following: the mechanism uses a single piece of metal to connect the rocker and the footboard. This provides a faster response, especially compared to the traditional models that use chains or belts to connect the two parts. The result is a pedal that has a professional and smooth feeling. An additional feature is represented by the springs – they can now be quickly detached, and that is very useful when you take your pedal on the road and don’t want to put undue tension on it. And if you’re always on the go, consider getting a drum practice pad to improve your skills in the spare time. If you, however, need to move your pedal to another set of drums, you will be glad to find out that it has a memory lock system, which will ensure that it stays at the same height and angle every time you use it. These pedals are made in Taiwan, and they have to pass a rigorous quality test before they are offered for sale. They resemble the classic design of the DW 5000 model, a pedal that was very popular at its time. This pedal has a slender build and has an ovalized footboard that bears the DW logo on it. Under the footboard, there is a steel plate fitted with Velcro strips. Additionally, similar to high-end models, this one has a bearing spring rocker assembly with a scale on its side that lets the user know the angle of the action. It is thus a very adjustable model. 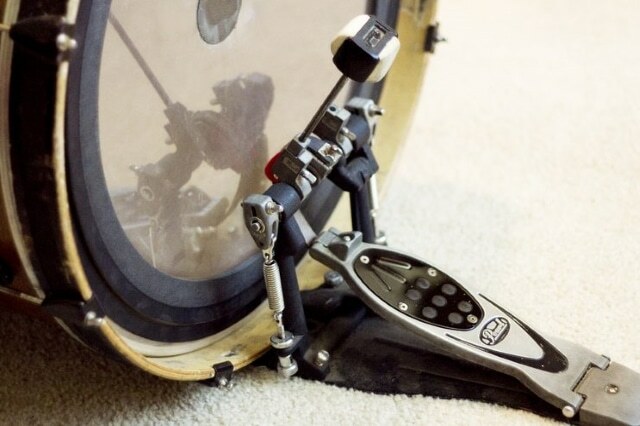 When attaching the pedal to the bass drum, the player doesn’t need to reach under the footboard, so it’s easily done. The resistance in the pedal is also adjustable and that ads extra comfort for the drummer. When used, the pedal is extremely silent. Looking at the chromed pedal, you can observe how beautifully finished it is, ticking all the aesthetic boxes. The innovative steel baseplate offers a new mounting system called Helix. It works using a ratcheting mechanism and it can be connected to the bass drum in one swift movement. This mechanism allows for small adjustments so that the pedal fits well with the drum, and it also ensures the pedal stays in place for a long time. You won’t have to adjust it after every song you play. The footboard and the beater angle can both be adjusted separately, adding to the comfort perceived by the drummer. An innovative pedal, this one has slots in the beater, where weights can be placed to offer a different feeling when hitting the drum. The cam is also easily adjustable, and that is achieved by loosening a bolt. This model is made of durable materials and it can take a beating and still offer you a great feeling when drumming, particularly when the mallet strikes the bass drum. It offers a sprocket design and a turbo drive based on a dual chain mechanism. What this means is that it gives a more realistic feel and a better connection between the beater and the footboard. The left pedal, on the models with the double bass on the right side, allows single-post casting for hitting the high-hat. That offers versatility because you can play the pedals on the left and right independently or simultaneously. If you want to bring out the best of your drums, make sure to set up a pair of overhead drum mics so they sound well on your recordings. It’s a good pedal for practicing, studio recording and live play, because of its durability, and the ability to remain silent for long periods. No squeakings will be heard when you use this pedal. Many drummers like the turbo sprocket because it is fast and feels lightweight, due to how accurate it transitions the force from the foot to the end of the beater. In terms of looks, the pedal shaft is finished in an attractive and shining red, instead of resembling plain alloy. The rest of the pedal is chromed or black powder coated, and that provides a delightful look. Unlike the models that offer a Velcro covering of the baseplate, the underside of this model has a rubberized pad that helps the pedal to have a better grip on most surfaces. The pedal has a Tri-Pivot system that is used to clamp it to the drum bass, and it is adjustable so that it fits well on the rounded drum. It does that with ease and it also helps to center itself in position better. The chain drive is adjustable and, when finding the right position for your foot, you can observe that you can action the pedal much quicker and will find it comfortable to play the drums. In the fifteen years since this pedal has been on the market, it has become one of the most popular models amongst professionals and beginners alike. This popularity should be attributed to the reliability that the model provides. In terms of looks, it offers a simple design, with the footboard and heel plate being finished with a brushed steel appearance. Because it’s so simple, it makes for a great addition to a drum set for kids. No complications needed. The brand has patented the interchangeable cams. They come in 4 styles and you can get 2 more if you want. The Powershifter is another unique function, that allows the footboard to move up and down the base. Interestingly, the bearings used are from skateboards and they should ensure a speed that is 85 percent better than that offered by previous models. This pedal performs great right out of the box, but it is highly customizable if needed. With so many variations that can be achieved, getting used to the pedal can take some time, but once you understand all the possible features, you should be delighted. This is an entry-level kick drum that packs a lot of features. For instance, it comes with a single chain, offset cam. As the brand describes the pedal’s footboard, it’s racing inspired, it has the shape of the sole of the foot, and the lines and dots are surely images of racing equipment. The footboard is somewhat concave, to offer more surface touching the foot and thus increasing the player’s control. On the underside of the base plate, there are pieces of material that look like Velcro but actually aren’t. They are strips of a material that is designed to offer great stability on surfaces like carpets, while not collecting hair and dust like the Velcro strips. Another interesting feature is the double-sided beater ball. You can choose between a surface that is hard and one that is softer when touching the bass drum. The 9000 series are some of the newest pedals built by DW and that can be seen in the elegance that they show and in how efficient they are. The footboards are chromed rather than the classic black and the frames are very sturdy without looking too clumsy. Unlike conventional pedals, this one has a floating rotor (the part that the chain is attached to) and not a fixed drive shaft. The use of this mechanism ensures a smooth action of the rotor without producing any noise. The whole ensemble feels complicated but efficient. Tension springs are placed on the inside on the frame and not on the outside, at the end of the drive shaft. By moving them closer to the central part of the pedal, the manufacturers aim to improve the alignment of the moving parts and cause as little unbalance as possible. With a racing-inspired footboard, this double pedal is designed to show you that it can provide the speed you need when executing complicated beats. The light grey finish applied on the model and the black details provide a stylish look. There is a single chain drive that connects the right pedal to the two beaters positioned there. The cams are offset, meaning that they will accelerate a lot quicker than the foot hitting the pedal, due to how they are made. The beaters can be used in two manners: a hard part can be employed, or, if you want some softer sounding tone, use the soft surface of the beater. This double pedal comes in great shape right from the factory, but you can heavily modify it as you wish. It is easily secured to the base of the drum with a wielded drum key. You will feel that the left and right pedals are nicely connected and when playing them they feel well harmonized. The pedal is an essential part of a drummer’s kit. It’s like the drum throne you sit on, in the sense that it should provide enough comfort all day long. But not only that; a pedal needs to be efficient, to transfer as much energy as possible in a precise and fast move that brings out the best sounds in a bass drum. Here are some characteristics that we think have a great impact on how a pedal performs. Being one of the most important parts of the pedal, the drive is the mechanism that connects the footboard, where the drummer presses his foot, to the beater, the part that actually hits the drum. It acts like a muscle, pulling on the cam to action the mallet. Drives come in three forms: direct, chain and belt drives. There is no given superior, no style of drive is better than another. But there are differences between them, and drummers tend to like to play one of them more than the others. They mainly vary in terms of durability and feel that they provide. The direct drive is the type that uses a straight piece of metal to connect the beater and the footboard. People that use it like it because it offers more control and a more accurate response. That is due to the fact that the metal bar doesn’t flex or give unwanted movement like a chain would do. Most commonly, a standard bass drum foot pedal uses a chain drive to action the mallet. Due to this, the mechanism feels smoother and offers less resistance than a direct drive. There are single-chain and double-chain models, and they represent exactly what one would expect – they use one or two chains respectively to connect the footboard to the mallet. Although you will find more single-chain models for entry-level pedals, that doesn’t mean they are worse. That is generally a characteristic of cheap bass drum pedals, but there are some great models that use a single-chain setup. They can be highly durable and some musicians actually prefer them. Maybe because they are used to that kind of pedal, single-chain models being the most popular. The last type of drive, the belt or strap one, uses a piece of material such as rubber, nylon or leather, or even the kind of fabric used for making conveyor belts. People that use this kind of pedals say that the action feels a bit more lively and the drummers feel more connected to the pedal. In terms of durability, this kind of drives has been considered to be less resistant than its counterparts, but due to recent developments in the industry, it can be said that belts have become more durable and thus can compete against chain or direct drives. Another great feature about the belt drive is that a drummer can easily see when the belt is deteriorated and he or she can replace it immediately. That’s a lot easier compared to a chain drive, where you can’t really see how damaged the chain is. Historically, the bass pedal had a single footboard that would be pressed to allow the beater to hit the drum. But with music becoming faster, and with different music styles coming into play, the need for a drum pedal capable of being operated faster appeared. Thus, double pedals, where both feet can be used, came into play. And their popularity rose, along with that of heavy music genres. For beginners, single versus double bass is probably the most striking feature to firstly look at. Depending on the style and needs of each player, a double bass model may be needed. But drummers should be aware that the double variant is much more expensive than the alternative. And that is for obvious reasons – it offers the possibility to play a lot more intense and different music styles. So, if you know that you’re not going to play heavy genres, or you’re just starting, don’t waste your budget on a double bass drum pedal and stick to the simple single bass pedal. If you’re using an electronic drum set you will need, of course, an electronic bass drum pedal, so keep that in mind. Bass pedal cams dictate how the mallet moves when the footboard is pressed. It’s the piece where the chain or the belt connects. Direct drive pedals don’t have a cam because of how they work. Differently shaped cams provide a distinct feeling. There are round cams, that, due to their shape, will make the beater move at the same velocity as the footboard is moving. The pattern is very consistent and that is why this kind of cams are great for those that want to have more control over their pedal. Flat cams are the ones that offer more acceleration to the mallet when moving towards the drum. They are great for drummers that like speed. There are also mixed-shape cams, and they provide a faster speed to the mallet, right before it hits the bass drum. Some drummers like the feeling that a mixed cam provides. Make sure to get the best out of your drum set and to do that, you need the greatest accessories. We have also written about how you can find the best drum stick. And if you’ve just started playing drums and you don’t have your set yet, look for a beginner drum set. We’ve discussed that too in a guide.